ALBERT, A.; AUFFRET, A.G.; COSYNS, E.; COUSINS, S.A.O. ; D’HONDT, B.; EICHBERG, C.; EYCOTT, A.E. ; HEINKEN, T.; HOFFMANN, M.; JAROSZEWICZ, B.; MALO, J.E. ; MARELL, A.; MOUISSIE, M.; PAKEMAN, R.J.; PICARD, M.; PLUE, J.; POSCHLOD, P.; PROVOOST, S.; SCHULZE, K.A. & BALTZINGER, C. (2015): Seed dispersal by ungulates as an ecological filter: a trait-based meta-analysis. Oikos 124: 1109-1120. ARNALDOS, I.; ROMERA, E.; GRACIA, M.D. & LUNA, A. (2001): An initial study on the succession of sarcosaprophagous Diptera (Insecta) on carrion in the southeastern Iberian peninsula. International Journal of Legal Medicine 114: 156–162. ARNALDOS, M.I. ; ROMERA, E.; PRESA, J.J.; LUNA, A. & GARCIA, M.D. (2004): Studies on seasonal arthropod succession on carrion in the southeastern Iberian Peninsula. Int J Legal Med 118: 197-205. BARTON, P.S. ; CUNNINGHAM, S.A.; MACDONALD, B.C. ; MCINTYRE, S.; LINDENMAYER, D.B. & MANNING, A.D. (2013): Species traits predict assemblage dynamics at ephemeral resource patches created by carrion. PLoS One 8: e53961. BÖNSEL, A. (1999): Der Einfluss von Rothirsch (Cervus elaphus) und Wildschwein (Sus scrofa) auf die Entwicklung der Habitate von Aeshna subarctica Walker in wiedervernäßten Regenmooren (Anisoptera: Aeshnidae). Libellula 18: 163-168. COSYNS, E.; BOSSUYT, B.; HOFFMANN, M.; VERVAET, H. & LENS, L. (2006): Seedling establishment after endozoochory in disturbed and undisturbed grasslands. Basic and Applied Ecology 7: 360-369. CUNZE, S.; HEYDEL, F. & TACKENBERG, O. (2013): Are Plant Species Able to Keep Pace with the Rapidly Changing Climate? PLoS One 8: 13. FEBER, R.E. ; BRERETON, T.M. ; WARREN, M.S. & OATES, M. (2001): The impacts of deer on woodland butterflies: the good, the bad and the complex. Forestry 74: 271-276. FULLER, R.J. (2001): Responses of woodland birds to increasing numbers of deer: a review of evidence and mechanisms. Forestry 74: 289-298. GILL, R.M.A. & BEARDALL, V. (2001): The impact of deer on woodlands: the effects of browsing and seed dispersal on vegetation structure and composition. Forestry 74: 209-218. GU, X. (2014): Animal biodiversity and food web restoration based on large vertebrate carcasses. Faculty of Environmental Sciences and Process Engineering, Brandenburg University of Technology in Cottbus – Senftenberg, Master of Science, 116 S.
GU, X. & KRAWCZYNSKI, R. (2012): Tote Weidetiere – staatlich verhinderte Förderung der Biodiversität. Artenschutzreport 28: 60-64. GU, X.; HAELEWATERS, D.; KRAWCZYNSKI, R.; VANPOUCKE, S.; WAGNER, H.-G. & WIEGLEB, G. (2014): Carcass ecology – more than just beetles. entomologische berichten 74: 68-74. HEGLAND, S.J. & RYDGREN, K. (2016): Eaten but not always beaten: winners and losers along a red deer herbivory gradient in boreal forest. Journal of Vegetation Science 27: 111-122. HEINKEN, T.; SCHMIDT, M.; VON OHEIMB, G.; KRIEBITZSCH, W.U. & ELLENBERG, H. (2006): Soil seed banks near rubbing trees indicate dispersal of plant species into forests by wild boar. Basic and Applied Ecology 7: 31-44. HEINKEN, T.; VON OHEIMB, G.; SCHMIDT, M.; KRIEBITZSCH, W.-U. & ELLENBERG, H. (2005): Schalenwild breitet Gefaßpflanzen in der mitteleuropaischen Kulturlandschaft aus : ein erster Uberblick. Natur und Landschaft 80: 141 – 147. HOLTMEIER, F.-K. (2015): Animals´Influenc on the Landscape and Ecological Importance – Natives, Newcomers, Homecomers. Springer, 978-94-017-9293-6, 522 S.
IRAVANI, M.; SCHUTZ, M.; EDWARDS, P.J. ; RISCH, A.C.; SCHEIDEGGER, C. & WAGNER, H.H. (2011): Seed dispersal in red deer (Cervus elaphus L.) dung and its potential importance for vegetation dynamics in subalpine grasslands. Basic and Applied Ecology 12: 505-515. KRAWCZYNSKI, R. & WAGNER, H.-G. (2008): Leben im Tod – Tierkadaver als Schlüsselelemente in Ökosystemen. Naturschutz und Landschaftsplanung 40: 261-264. MALO, J.E. & SUAREZ, F. (1995): Herbivorous Mammals as Seed Dispersers in a Mediterranean Dehesa. Oecologia 104: 246-255. MALO, J.E. & SUAREZ, F. (1998): The dispersal of a dry-fruited shrub by red deer in a Mediterranean ecosystem. Ecography 21: 204-211. MANIER, D.J. & HOBBS, N.T. (2006): Large herbivores influence the composition and diversity of shrub-steppe communities in the Rocky Mountains, USA. Oecologia 146: 641-651. MELIS, C.; BUSET, A.; AARRESTAD, P.A. ; HANSSEN, O.; MEISINGSET, E.L.; ANDERSEN, R.; MOKSNES, A. & ROSKAFT, E. (2006): Impact of red deer Cervus elaphus grazing on bilberry Vaccinium myrtillus and composition of ground beetle (Coleoptera, Carabidae) assemblage. Biodiversity and Conservation 15: 2049-2059. NATHAN, R.; SCHURR, F.M. ; SPIEGEL, O.; STEINITZ, O.; TRAKHTENBROT, A. & TSOAR, A. (2008): Mechanisms of long-distance seed dispersal. Trends in Ecology & Evolution 23: 638-47. NESSING, G. & ZWERBE, S. (2002): Wild und Waldvegetation – Ergebnisse des Monitorings im Biosphärenreservat Schorfheide-Chorin (Brandenburg) nach 6 Jahren. Allgemeine Forst und Jagdzeitung 177-185. NUMA, C.; RUEDA, R.; VERDÚ, J.R. & GALANTE, E. (Hrsg.) (2010): Influence of grazing activities on species diversity of dung beetles in Mediterranean pastures. Tagungsband zum Options Méditerranénnes: Série A. Séminaires Méditerranéens in 277-280 S.
PAKEMAN, R.J. (2001): Plant migration rates and seed dispersal mechanisms. Journal of Biogeography 28: 795-800. PELLERIN, S.; HUOT, J. & COTE, S.D. (2006): Long term effects of deer browsing and trampling on the vegetation of peatlands. Biological Conservation 128: 316-326. PETRAK, M. (1992): Rotwild (Cervus elaphus Linneus, 1758) als Pflegefaktor für bärwurzreiche Magertriften (Arnicetum montanae Schw. 1944 & Meo-Festucetum) in der Nordwesteifel. 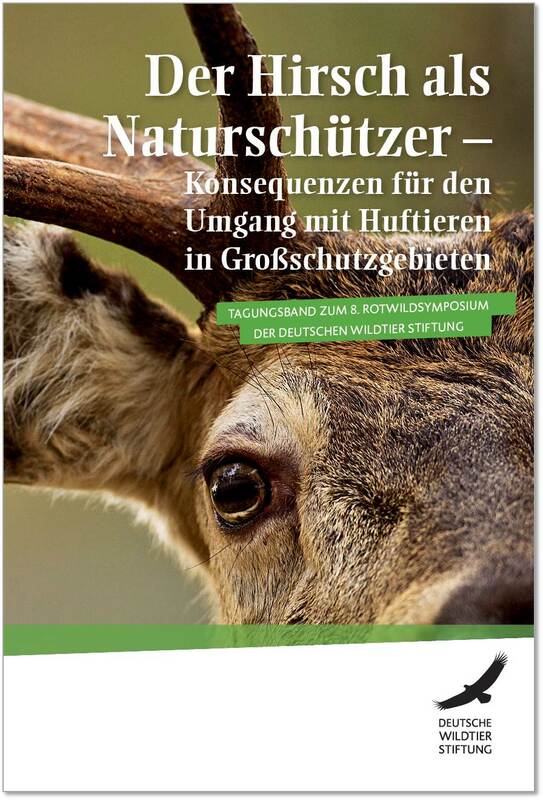 Zeitschrift für Jagdwissenschaft 38: 221-234. PICARD, M. & BALTZINGER, C. (2012): Hitch-hiking in the wild: should seeds rely on ungulates? Plant Ecology and Evolution 145: 24-30. PICARD, M.; PAPAIX, J.; GOSSELIN, F.; PICOT, D.; BIDEAU, E. & BALTZINGER, C. (2015): Temporal dynamics of seed excretion by wild ungulates: implications for plant dispersal. Ecology and Evolution 5: 2621-32. RECK, H.; HUCKAUF, A. & THIEL-EGENTER, C. (2009): Pilotstudie „Wild + Biologische Vielfalt“. NATUR+MENSCH, S. (Hrsg. ), 145 S.
REICHMANN, A. & KOLSHORN, P. (2016): Waldweide im Naturschutzgebiet Brachter Wald. Natur in NWR 1: 19-23. SCHÜTZ, M.; RISCH, A.C.; LEUZINGER, E.; KRUSI, B.O. & ACHERMANN, G. (2003): Impact of herbivory by red deer (Cervus elaphus L.) on patterns and processes in subalpine grasslands in the Swiss National Park. Forest Ecology and Management 181: 177-188. SELVA, N. (2004): The role of Scavenging in the predator community of Bialowieza Primeval Forest (Poland). Bialowieza, Poland, PhD Thesis, 221 S.
STEWART, A.J.A. (2001): The impact of deer on lowland woodland invertebrates: a review of the evidence and priorities for future research. Forestry 74: 259-270. STÖCKER, B.; A. KINSER & H.Frhr.v. MÜNCHHAUSEN (2010): Wild im Wald – Rothirsch und Co. als Retter der Artenvielfalt? Deutsche Wildtier Stiftung (Hrsg. ), ISBN 3-936802-09-2, 18 S..
TOWNE, E.G. (2000): Prairie vegetation and soil nutrient responses to ungulate carcasses. Oecologia 122: 232-239.
von OHEIMB, G.; SCHMIDT, M.; KRIEBITZSCH, W.-U. & ELLENBERG, H. (2005): Dispersal of vascular plants by game in northern Germany. Part II: Red deer (Cervus elaphus). European Journal of Forest Research 124: 55-65.